Phiona Mutes asks her mother the question, “can girls from small places achieve big dreams?” in the upcoming Walt Disney film Queen of Katwe, wondering if she would ever be able to obtain her dreams despite living in an impoverished slum in Kampala, Uganda. Channelling the fierceness she inherited from her mother, Phiona goes on to become a world champion chess player – a feat only made possible by the opportunities that were given to her because of a stranger’s belief in her potential. Girls all over the world living in poor communities are faced with many of the same challenges as Phiona – but unfortunately, few will ever have a special person reach out, believe in them, and give them a chance to escape poverty so they can work towards their dreams. In a small village only forty-five minutes away from where Phiona Mutes grew up in Uganda, lives another girl with big dreams and an interest in chess named Catherine who is at risk of being trapped in a life of poverty. Catherine is only seven but she already has big dreams for her future: “All I want is to become a doctor and treat people to regain their lives,” she told us. With a grandmother and mother who are often unwell, Catherine has seen the importance of having a doctor in a community like hers. She knows that doctors are very smart – smart just like Phiona and other chess players –¬ and she knows that to become a doctor you need to go to school. 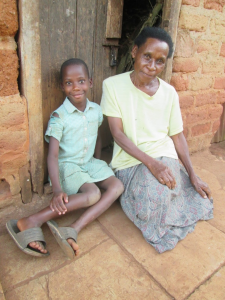 Sadly, Catherine’s mother Sarah does not earn enough money to send her to school. Catherine’s father abandoned the family, and her grandfather who had always been there for them passed away last October. Sarah does her best to feed Catherine, her son Michael, and her elderly mother on her limited income as a tailor. Despite Sarah’s hard work, Catherine and her family often go without food. 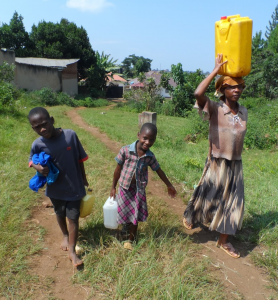 Catherine, her brother Michael, and their mother fetching water. 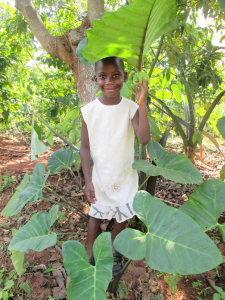 Thanks to donors like you, Catherine attended grade one this year, where she also received nutritious meals each day. It has made a big difference for her and her family – but as a young girl living in rural Uganda, Catherine is very vulnerable and faces a high risk of dropping out of school. Catherine and girls just like her in the communities we support around the world face many challenges as they grow up and try to stay in school. Child marriage and early motherhood are one of the biggest threats. In Uganda, Catherine is at risk of becoming part of the 50 per cent of girls under 18 who are married – in a country, like many others, where tradition supports child marriage as a solution to constrained family resources. If Catherine is able to stay in school despite the financial challenges her mother faces, she will still face barriers to education as she enters adolescence. Catherine will need a school well equipped with private latrines so that she – and her female peers – can continue to attend school safely and comfortably. Catherine will also need trained and passionate teachers who can guide her towards higher education, and encourage her to reach for her goals. CFTC’s generous supporters help provide what’s needed so that girls like Catherine can stay in school and fulfill their full potential. Donors support parents as they improve their livelihoods so that they can care for their children and keep their daughters in school. They provide safe, well-equipped schools with trained and committed teachers so that girls can reach higher education. And they help reduce child marriage and early motherhood by providing communities with trained advocates, who visit at-risk girls and speak to parents about finding solutions to keep them in school. So, if you see Queen of Katwe this fall – perhaps alongside a special young girl in your life – please remember that it takes just one person who cares can help a young girl’s dreams come true!